The Creuse together with the departments of Haute Vienne and Coreze make up the vast area known as the Limousin . The three department capitals are Gueret, Tulle and Limoges, Limoges is also the regional capital. This is a little known area of France even for the French; if it is known at all it is mostly for the distinctive reddi-brown cattle that thrive here. It has remained almost unchanged for the last 25 years, an area that has escaped the stress of modern living, where old-fashioned cultures still abound. This imparts to any visitor who should happen here the perfect environment for relaxation and the chance to enjoy a stress free holiday and sample the good life. As well as many countryside activities, such as walking, fishing, cycling, horse riding, sailing, canoeing to name but a few, also offers many varied attractions. The Crozant School of painting situated between the rivers Creuse and Sedelle, the ruins of Crozant, made famous by Claude Monet, Armand Guillaumin and other postimpressionist and cubist, who painted famous landscapes. Here you will find outstanding views - bring your art materials and join in the fame. Tapestry, lace and enamel work and porcelain all abound in this beautiful area, and of course found in abundance at the local markets. Aubusson became the home of tapestry, when in the early 16th century Flemish craftsmen settled ther after the Count of the Marche Louis I Bourbon married Marie de Hainaut. Visit the tapestry houses at Aubusson; there must be at least 20, as well as a museum. There are many museums many of which are specialist. At Gueret there is the magnificent museum of decorative arts, history and archaeology, as well as an unusual electricity museum at Bourganeuf. Many château and castles are to be found in the area. Visit the rooms the George Sands occupied when she stayed at Boussac. Where she received support and inspiration for some of her greatest novels. Other chateau include Château de Villemonteix at Chenerailles, Château de Mazeau at Perfat-La-Narriere at at Levaufranch Commarderie des Templiers et des Hospitalier. Many more can found further a field. The pilgrim road of Santiago de Compostella runs through the region on its way South. Pilgrims and monks from all over Northern Europe crossed through two villages, Benivent C'Abbay and Leonard de Noblats heading for the shrine of Santiago de Compostella on the northwestern tip of Spain. The route is marked by the emblem of Saint-Jacques (a scallop shell), today pilgrims walk, ride and cycle this famous route, visiting the numerous churches and abbeys that have sprung up along the way. 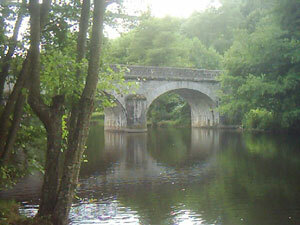 A route dedicated to Richard the Lionheart links the castle and sites, which formed the backdrop to his life in the Limousin, a time when England rules much of France. Most lost of course by his brother John of Magna Carta fame. The Limousin boats a thermal baths at D'Evaux-les-Bains, the baths date back to roman times, people vist for all manner of reasons, therapeutic, relaxation and to drink the waters to effect a cure or to improve general well being. For water sports there are many rivers and lakes one of the biggest is Lac Vassiviere, which is man made and supports anything from water skiing to, pleasure boat rides. Wolves were once the natural inhabitants of the Creuse and are now being reintroduced, visit Les Loups de Chabieres the parc dedicated to wolves and learn more about this very different animal; prepare to be amazed. Gueret approximately 15 - 20 mins distance from us, with its many shops and restaurants and charming old fashioned shop fronts line the street, browse in the ironmongers, haberdasheries and craft shops. Visit the giant maze for a day; follow the clues (takes about two hours). Relax with a picnic lunch afterwards. If it is the food that attracts you to France, then in the Creuse you will be in for a treat. Some of the specialities include Limousin beef, pate de pommes de terre a layered potato cake wrapped in a delicate wafer of pastry, galetous a griddlecake and clarfoutis a black cherry dessert. Fresh fish from the rivers, chestnuts and mushrooms from the woodlands as well as truffles and foie gras, fresh myrtle tart and gateaux Creusois, have dinner with us to sample a few.